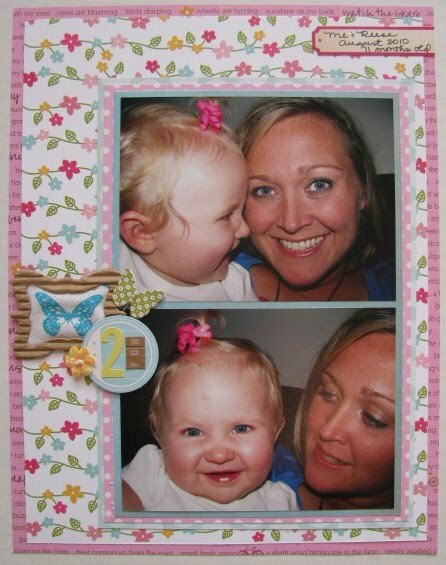 I really enjoyed working with the March "Butterfly Gardens" kit from Polka Dot Whimsy. Even though the kit appeared really feminine color-wise - lots of pinks, pastels - it worked perfect with my spring and Easter photos. When I saw coffee filter shapes included with the kit, I wanted to mist them with some of the new Mr. Huey mists I had recently picked up at CKC. I thought the scalloped ones looked like clouds. Now that I have the layout posted, I realize that they look much better in person (trust me!)... This layout of Blake shows him crowing the Virgin Mary during the May Procession at church last spring. I was so proud of him. I used a mixture of papers by Echo Park, Kaiser Crafts and Pebbles. It was fun grouping some embellishments for my title placement. I layered a couple flowers with a sequin. I also opted to keep the Jillibean Soup corrugated frames in their natural kraft state. The only thing I used that wasn't in the kit was a section of Pink Paislee baker's twine that I wrapped around the larger photos to hang a tag (from the kit). I love making 2-page layouts, but since the kits only come with one sheet of each color of cardstock, I usually stick with single page layouts. 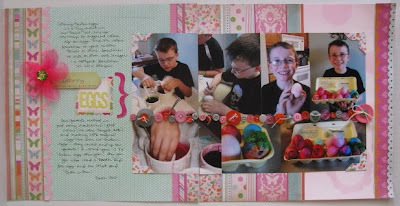 I really wanted to use our egg decorating photos from last Easter with this kit, so I got creative. I decided to split up the 'strip' paper by Kaiser Craft across a sheet of polka dot patterned paper and a solid cardstock. The solid pink cardstock was a bit bland with the rest of the spread so I placed some of the corrogated Jillibean Soup shapes on top of the cardstock and sprayed them with white Mr. Huey mist. I thought the cardstock tied into the layout better after creating the mask. I loved adding the row of buttons to separate the two rows of photos. I have a confession to make... I'm a bit OCD when it comes to buttons. I MUST have them either sewn on the page or at least tied. I can't have a "naked" button on my layouts. For my title, I again layered a couple die cuts. I did do something that I hadn't done in years though - I got out my old Creative Memories pens and added "Coloring" to my title in multiple colors. I thought it tied in with the theme nicely. And, even though the background paper wasn't ruled, I was still able to journal (a lot!) directly on the page. The next page is a lift of myself. 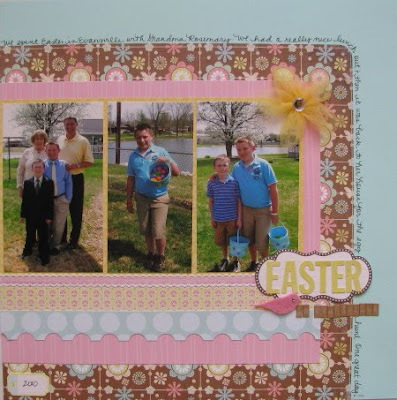 A few weeks ago I had created another layout using Easter photos. I liked it so much that I decided to stick with the same design, but flipped, for this layout. I have another confession to make...I really wasn't a fan of the Basic Grey papers in this kit. BUT I really liked the finished product here after using the brown/floral pattern I used as the large back piece on this page. I used a border punch on the dot paper, but then cut the scalloped edge off to give it a postage-stamp edge. Isn't the felt bird, cute? Oh, and what good is a pastel/floral-y kit if I don't finish a Reese page with it? I loved these shots of us together in August. "2 Fun" seemed like an appropriate title. I used one of the Jillibean Soup frames to frame a butterfly from the fabric piece included in the kit. I thought it gave a bit of a "quilted" look. This was a fun kit to work with. I still have a lot of products left so you may see more with it in the future. I love all the little touches you are adding to your layouts...the bakers twine in the first and your buttons in the second is gorgeous. Beautiful layout! Love the clouds, very clever and the third layout is my fav, love the simplicity of it and the journaling around the side of the page! Nicely done, looks like a fun kit!